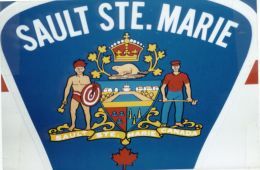 We lived in Sault Ste. Marie, Ontario for six years—from the spring of 1977 until June 1983. 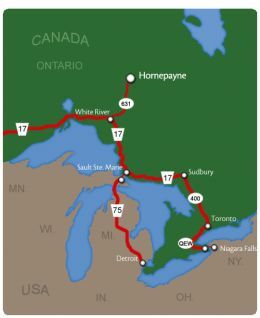 The Sault or The Soo sprawls along the St. Mary’s River between Lake Huron and Lake Superior. It was following a job that took us there, and lack of employment that caused us to pack up and move on. I worked at Algoma Steel until the worldwide economic malaise reached the northern town. On April 1, 1982 I was handed a pink-slip informing me that the company no longer required my services—Happy April Fools’ Day to me. As it happened my brother-in-law was on track and in training for a supervisor’s slot. In an ironic twist, it fell to him to give me my walking papers. It troubled him for a long while, but didn’t bother me at all. The handwriting on the wall was clear. That spring and summer saw lay-offs that affected over seven thousand families. It was a dismal economy, with lots of stresses and desperation as the unemployment rate in the city climbed into the teens. When we first moved, The Soo was a boomtown. When we departed, the new realities of a global market had begun chiseling away at the town’s steel industry. Nowadays what used to be known as Algoma Steel is Essar Steel Algoma—it’s a skeleton of the place that employed me. I mostly worked in material handling. At first that meant shovels and wheel barrows, since that was the bottom of the ladder. 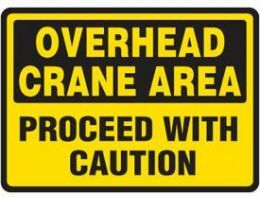 Eventually I’d make my way up the rungs to drive a bin-car and become an overhead crane operator. 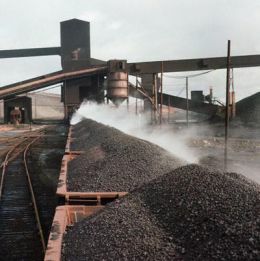 It was always about transferring the raw materials of coal, coke, iron ore, and chemicals into place on the first step of the process of making iron and steel. One of the worse assignments I ever had was at a cheery section nestled behind a bank of coke ovens called the Dumping Station. It was a dirty, dusty and dangerous place to work. The joke was that if The Soo ever needed an enema the Dumping Station was where they’d stick the rubber hose. Over the course of time, I was teamed up with a variety of partners at the Dumping Station, but one fella is singularly memorable. Graham was a lean, rangy ex-biker with the name Rev painted on his hardhat. I figured the nickname was a joke played off of Billy Graham, so I asked him. That was the only explanation I ever got. Rev had a bottomless sense of humor that saw the ludicrous in every situation—he managed to transform ordinary tasks into laugh out loud hilarity. He also had a healthy distrust of the bosses, and would demonstrate contrariness with them—it was always wonderful to have a front row seat to eye-witness his antics. What the Dumping Station job entailed was this: Railroad cars loaded with ore were lined up. One at a time, we’d position them over an in-ground bin, unlock the doors on the bottom, then using those precise gadgets known as sledgehammers, we’d bang open each door, a worker on one side and his partner on the other. The trick was to move fast and in unison, and then get out of the way of the cloud of dust that’d mushroom up from every car. Beneath the in-ground bin a conveyor belt distributed the ore in a series of hoppers to fuel the beast of a blast furnace known as #7. Compared to its relatives #4, #5, #6, it was a monstrosity that had a voracious appetite, which kept laborers scurrying down at the Dumping Station. Water was used to try to settle the dust before the cargo was unloaded. A pipe arched over the cars just outside the enclosure where we actually performed the task of releasing the cargo. If the cars could get soaked for an hour or so, then the explosion of dust was somewhat bearable. Getting the ore thoroughly saturated was a near luxury which would occur once and possibly twice per shift. The norm was that we kept up a rapid tempo that allowed each car to be watered down for only a few short minutes. We’d bang out six, eight or ten cars before all of #7’s multiple stomachs were filled. There’d be a short break, in which we’d get set-up for the next round of feeding the beastly #7, then go inside to a lunchroom. We’d discard the soiled masks, retrieve fresh ones and shoot the breeze or play cards. On a particularly hot summer day, we got a call from our supervisor who reported that a couple engineers from the front office were going to report to the Dumping Station to do a study on the ventilation system, which was truly nonexistent. The dust and grime was everywhere—nothing anyone tried ever helped much. I shrugged, went outside and closed the valve to the overhead pipes. We quickly cleared off three cars, and then positioned another over the bin. It was untouched by a drop of water. At this point, Rev turned the water back on, so it had the appearance that it’d never been off. Then we waited. As luck would have it, the pair of engineers arrived just as the in-ground bin was getting close to empty. Sure enough they were wearing white shirts and ties, and carrying clip boards. One of them had an overfilled pocket protector in his shirt. The other one had a military bearing and a flat-top haircut. Rev took charge, giving them a grand tour of the puckered arse-hole. He was friendly and accommodating. It was apparent that this was their first ever visit to the Dumping Station. They were wide-eyed, asking questions that reflected a stunning ignorance of procedures. I simply stood by, watching and suppressing a smirk, knowing exactly what was coming. Rev positioned the investigators at a spot where they’d be out of the way, yet still get the full effect of the dense blast of grainy dust. He winked at me, and then climbed over to his side. We unlocked the three cargo doors, readied ourselves, and on signal smashed them open in rapid succession and raced out of the billowing swell of dust. Trapped inside a blinding blanket of filthy black dust, the engineers were coughing, hacking, and cursing up a storm. We scrambled around the backside of the station in time to see them stumble outside. Grim-faced and glaring, they climbed into their vehicle, and sped away. “We’ll never see those jerks again,” Rev said, choking on laughter. And he was right—we never did. The Yard Gang was where workers were posted when a furnace was shut down. It was its own little feudal fiefdom within the steel plant. Rules and pecking orders were set and enforced by an interrelated and inbred band of wannabe big shots. I did several tours of duty there, each time falling in with a Yard Gang lifer named Eric. He was determined to prove that one could pick up a paycheck for horsing around, defying authority, and playing hide and seek with the foreman. Eric loved a good story, and so as a natural born storyteller, we hit it off. He schooled me in getting along, and on the whys and wherefores of out foxing the bosses. For reasons still unknown to me, to him and him only, I was always referred to as Bud. We connected. I soon discovered it was a great deal of fun to beat the system. As baseball has its Designated Hitter Rule, Eric developed what he called the Designated Worker Rule. He’d get a crew together, and compel one or two to complete the tasks assigned to all of us, then we’d drift away and proceed to wander around and visit other areas, take naps, and generally loaf. It was an ingenious system. He kept the rotation fair, even taking his turn once a week or so as one of the designated workers. As long as the tasks got done and everyone appeared busy it worked like a charm. The key was to always stay ahead of bosses and their sycophants. And sometimes that meant hiding in plain sight, with a shovel or rake in hand while staying on the move from one job site to the other. One spectacularly gung-ho boss named Frankie was an object of derision and the customary target for many of Eric’s practical jokes. To be fair, Frankie invited most of it upon himself. He had the IQ of a kumquat—he wore the hardhat of a supervisor based upon being married to a daughter of the kingpin of the Yard Gang, a man who collected favors and handed out patronage as though he was an old-style Mafioso godfather. Round-faced and round-bodied, Frankie may have been the model for the Pillsbury Doughboy. To top it off he had a slightly effeminate air about him and a squeaky voice that’d peak into shrill territory whenever he was excited or upset. It was always considered a fine day whenever someone could make Frankie squeal like a girl. 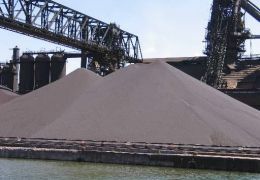 On a morning when Eric and I were the designated workers, a hopper full of iron ore pellets was spilled on the ground. We took to the task of cleaning up the mess with all the enthusiasm of death-row inmates on their way to the electric chair. It took us over an hour to arrive at the site. Even at a snail’s pace walk, it was less than ten minutes from the Yard Gang trailer, but we made several stops along the way. Upon arrival we leapt in feet first and were hard at it. A half-dozen or so shovelfuls later, it was time for a cigarette break. While squatting on our hunches we surveyed the pile before us. I didn’t argue with him. We finished our smokes and got back to it. Another half-dozen or so shovelfuls later, we stopped and shrugged at each other. We saw Frankie coming and began leaning on our shovels to wait for him. “We’ll get to it, Frankie, but we can’t do it just now,” Eric said, sounding upset and discouraged. “Okay, good.” Frankie pursed his lips authoritatively, then turned and headed off to his next destination. He was twenty yards away before it struck him. He spun around and stormed back at us, red-faced and bulgy-eyed. “You bastards get to work,” he snapped, his voice hitting those high feminine notes. Frankie gave us a squealing protest, then saw the futility of it and waved us toward the trailer. Away we went, shovels shouldered like rifles as we marched briskly off to break. All things considered it was shaping up to be a fine day. Operating an overhead crane on the blast furnace floor had its perks and drawbacks. Sometimes it was nonstop, while at other times it was merely extended periods of excruciating boredom. On a certain graveyard shift—one in which I became legendary—it was hectic and chaotic from the moment I arrived. I was scheduled to cover the cranes on #4, #5 and #6. That meant coordinating with three crews and casting times. It started off bad and got worse as the clock ticked away. I spent a couple hours at #6, then an hour and a half in the crane at #4, stopped for a whiz, then moved materials around for the #5 bunch for a solid two hours. There was another lift to make and I waited for the worker responsible to come out to hook it up. I looked at my watch. It was nearly 4:00 AM. Other than the short break to tap a kidney I’d been at it since 11:00 PM. I waited a full twenty minutes, then parked the crane and descended. Just as I started across the furnace floor toward the lunchroom, a slacker who I knew as Georgio came out and pointed at me. “I need you to make a lift,” he said, rubbing his eyes. He’d obviously been sleeping. His hardhat was painted the colors of the flag of Italy, and he had a superiority complex regarding his country of origin. He also had proven to be unreliable and a complainer, which was strike one and strike two in my books. The sleep-addled eyes amounted to strike three. “You gotta go back up and lift that out of there,” he told me, pointing at a crate filled with scrap. 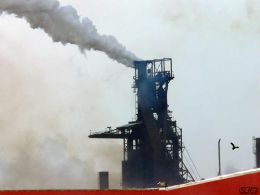 “I’ll tell the foreman,” Georgio said, then turned and headed toward #5’s office, which was around the back of the blast furnace. I’d like to tell you that I ignored him, went to the lunchroom and had a leisurely meal. I’d like to say that I strolled away, put my feet up and relaxed. It’d be nice if I could honestly tell you that neither his attitude nor his threat bothered me at all. I’d surely like to tell you all of that and more to show you that I’m really a calm, levelheaded man with patience beyond all imaginings, but the facts stack up a bit different. It was four in the morning. My belly was growling and gnawing away at its lining. In the best of circumstances I have what is euphemistically known as a short fuse—these circumstances would never get filed under the best category. What went through my head was, if he’s going to the foreman then so am I to tell my side of the story—though I suspect that there were some nasty cusswords sprinkled in at appropriate junctures. I took off like a shot, running after him. I caught up, grabbed him by a shoulder and spun him around to face me. I had him lined up and would have cold cocked him with a right cross, except for the frightened look in his eyes. He was as tall as I was—we were eyeball to eyeball—but all of a sudden he looked like a little boy. I could taste the fear coming off him. He wrenched free from my grip and continued on his way to the office. I followed, arriving when he was in mid-whine. The foreman, a swarthy old-school man who went by Dino, glanced in my direction. He read the anger bugging out of me, poured a coffee, pushed it to an open spot on the table and told me to sit down. When I did so, my adversary started yakking again. Dino listened and nodded agreeably, which soothed Georgio. By the time he finished his complaint, he was close to tears. I sipped my coffee, lit a cigarette and waited to get reamed out. Dino assured Georgio that I’d be dealt with accordingly, then told him to go finish his work. Somebody would be out to make the required lift. “Yeah,” I muttered, giving him a broken kind of smile. I got sent to the showers and told to call it a night. That midnight run—me chasing after him—became mythic. I don’t recall ever talking about it, but evidently the story filtered out. What spurred it along was that for several days afterwards Georgio acted like a celebrity victim. He kept retelling his version and showing off to all our co-workers the bruises on his shoulder, which were supposedly put there by me. From then on, the word was out that one crossed me at their own peril. It mattered not that there was never any other incident—the reputation for fierceness was established and ingrained. Many years later when I heard someone tell the tale I smiled inwardly because it had taken on details that never occurred. Not that the retooled bits made any difference, because all statutes of limitations had most certainly expired. These steel stories are phantoms from another time and place—shadows that helped to shape and change me. Life is process so I carry them with me, some as scars and others like a comforter of good memories.